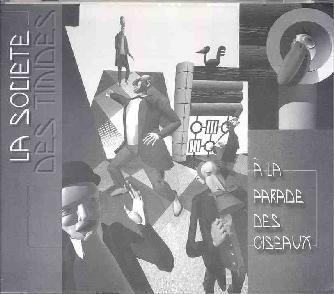 La Societe Des Timides A La Parade Des Oiseaux - "86-'90"
La Societe Des Timides A La Parade Des Oiseaux (La STPO), which means "the shy people at the bird parade", have been active since the mid-1980's, and fit firmly into the same RIO branch of avant-progressive rock that bands like fellow Frenchmen Etron Fou Leloublon did. The band have apparently had a turbulent history as the information at the Beta-Lactam site indicates they've had 30 members over the years (they still play concerts). This set reissues an EP from 1986 and an LP from 1990, making for 22 tracks that are often less than a minute in length, and rarely exceed 3 minutes. Instrumentation includes guitar, bass, drums, synthesizers, trumpet, cello, clarinet, and vocals. There are lots of stylistic influences here. The music has the same quirky rhythms and theatrical (often humorous) vocals that Etron Fou did, and one singer is even a dead ringer for Gigou Chevenier. But the trumpets also provide a powerful reminder of Dr Nerve, and I also hear wee traces of more standard jazz trumpet. Transitioning at lightening pace between tracks and themes, the music will at one instant be embroiled in an avant-prog stage drama, and then move on to what sounds like free improvisation along the lines of Henry Cow in their more abstract moments. The band can also rock hard and have a very good guitarist who I would have liked to have heard take a more active role. The guitar adds lots of free improv styled noise and aggression, but can also kick out some fiery shred soloing. If you're a follower of RIO styled prog rock then it's pretty much assured that you'll like La STPO. They follow in the footsteps of others, making analogies easy, but do a good job of making these sounds their own as they come roaring out of the starting gate and taking continual abrupt twists and turns that manage to flow seamlessly from start to finish. Just as fun as they are intense, I enjoyed being swept through La STPO's whimsical multi-themed set of creative constructions. For more information you can visit the La STPO web site at: http://www.stpo.blrrecords.com/. La STPO is distributed by Beta-Lactam Ring Records. You can visit their web site at: http://www.blrrecords.com/.